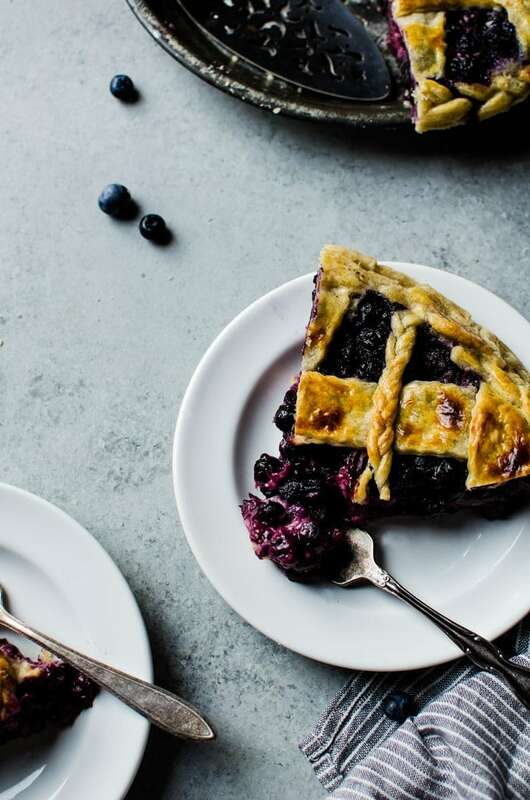 A sweet and slightly tangy blueberry buttermilk pie with ginger. This mouthwatering pie is unlike any other you’ve ever tasted. So I’ve been on a quest to perfect my pie skills. Mostly to try and do those beautiful and intricate pie designs I see some bloggers do. Have you seen this pie? What about this one? But it was this macrame design that made me decide I needed to up my pie game. Now, you may have seem my first attempt at a lattice with this strawberry cherry pie. Not pretty. But this time I decided to work with a half butter half shortening pie crust so I still get the ability to handle the crust more, but still have it fluff up a bit and taste amazing. This is definitely my new favorite pie crust recipe! I decided to try my hand at a braid which I’ve always thought was really beautiful on a pie. It was surprisingly easy because of the shortening – and it didn’t take too long either. I probably could have gotten it done in maybe 10 minutes, but I was distracted by watching Facebook Live videos while making the pie! My biggest pointer for the braid on the edge of the pie: make sure it is set firmly on top of the lip of the pie and the center of the braid is closer in toward the middle of the pie. Otherwise, the braid can fall off while baking as the crust puffs. (Luckily, since the shortening keeps the crust in whatever shape you put it in, if the crust falls off, you can carefully position the crust back on top of the pie if you catch it early enough. Not that I am speaking from experience or anything. What? I just heard this from someone else…. a friend. So let’s talk about my secret ingredient in the blueberry buttermilk pie. Did you guess it yet? I mean, I did kinda make it obvious. Yup. It’s the buttermilk. I didn’t just put it in the crust or anything, It is right in the pie with the blueberries and it makes it so tasty and amazing! It adds this lovely tang to the blueberries, especially with the addition of the ginger. Oh my gosh, this blueberry buttermilk pie is so good, it was gone in 12 hours. That’s right, it didn’t even last a whole day! Because of how much we put in this blueberry buttermilk pie, I recommend a deeper dish for the pie. The pie dish I used is somewhat shallow and I was able to fit everything in, but did have some buttermilk drips before baking. Nothing major, but to keep things neater, I think a deeper pie dish would be helpful. I have a lot of people ask if they can use frozen berries in my pie recipes. We used fresh berries in this particular blueberry buttermilk pie (fresh blueberries we picked ourselves at the farm! 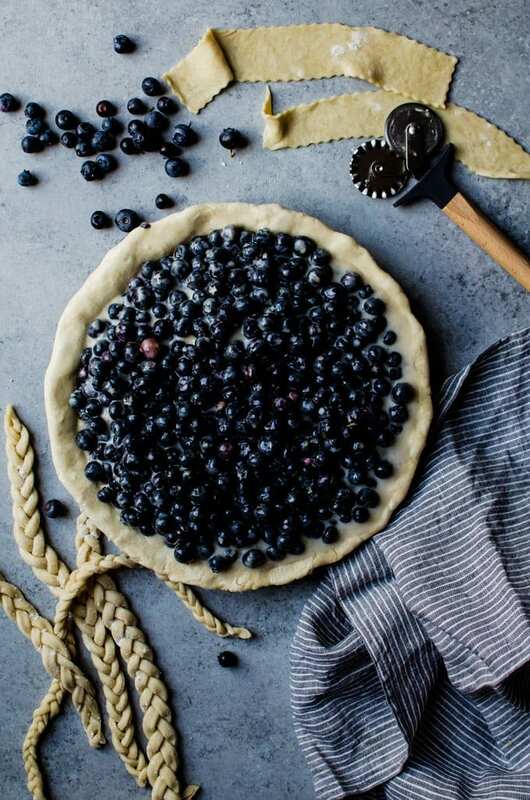 ), but the pie does get frozen before you bake (in fact the freezer is basically our BFF right up until it is time to bake), so I don’t see why we couldn’t start with frozen blueberries, provided you keep the berries frozen the whole time before you bake. 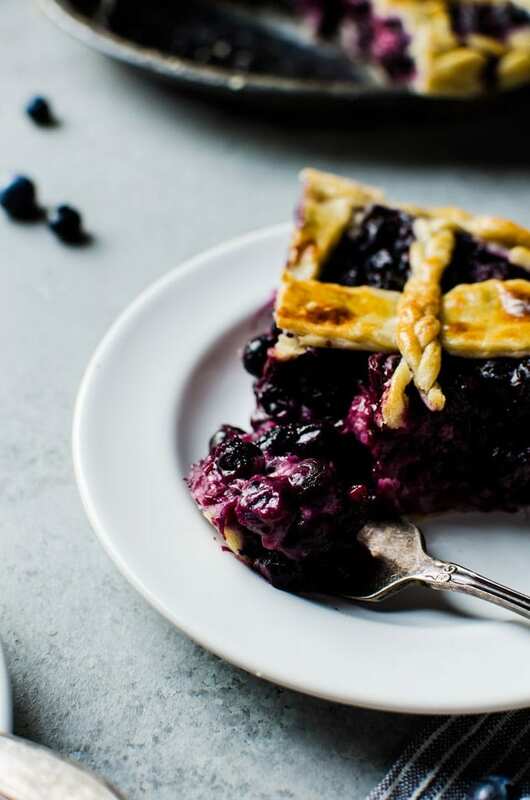 A sweet, tangy, and completely mouthwatering blueberry buttermilk pie. You won't any other pie after this! Mix together the flour, salt, and sugar until well combined. Cut in the shortening and butter using a pastry cutter, or food processor until the mixture resembles coarse meal. Slowly add the ice water until the mixture just starts to look chunky and holds together when pressed. Turn the dough onto plastic wrap and form into a disc. Chill in the refrigerator for at least 1 hour, preferably overnight. Divide the dough almost in half - roughly a 55/45 split. Roll out the larger half until it is a ¼-inch circle and place into a pie pan. Tuck in the edges under the dough, leaving a small amount of the dough hanging over the lip of the pan. Place the pan in the freezer, and chill the remaining dough in the refrigerator. Rinse and drain the blueberries and set aside in a large bowl. In a separate bowl, mix together the sugar, buttermilk, arrowroot starch, lemon zest, vanilla bean paste, ginger, and salt. Whisk until well combined. Pour the buttermilk mixture into the bowl with the blueberries and mix until well combined. Pour the blueberry mixture into the pie shell and place in the freezer. 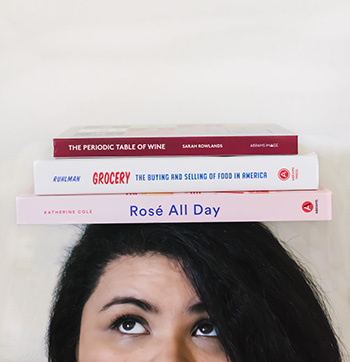 while you work on the top crust. Roll out the remaining crust dough until ¼ inch thick. Cut thin strands of the dough in groups of three for the braids. Leave the strand connected with about a centimeter border on one end. Slowly create a braid with the strands. I used one long braid for the center of the lattice and a smaller one going the opposite direction. 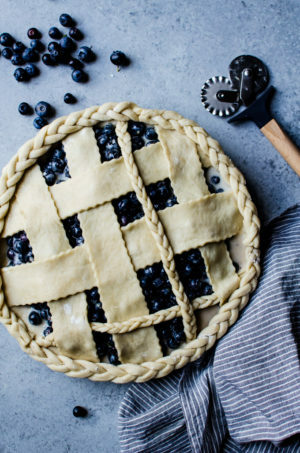 I used three braids that I connected together by pinching the ends together to circle around the pie crust. As you make each braid, place them on a lightly floured plated and leave in the refrigerator to keep cold. Reroll the remaining dough and cut out strips that are about 2 inches wide. Remove the pie from the freezer. Create a lattice using two of the braids and the strips. Press down the edges so they adhere to the crust. Take the remaining braids and place firmly along the edges, making sure they aren't too far out or else they will fall off during baking. Place the pie in the freezer for about an hour. While the pie is freezing, preheat the oven to 350 degrees F.
Remove the pie from the freezer and brush the top pie crust with the egg wash.
Bake for 18 minutes, then cover the edges with aluminum foil to keep the edges from burning. Continue to bake for at least 40 - 50 minutes longer, or until the top is golden brown and the filling is bubbling and steaming hot. Remove from the oven and cool completely to room temperature. Beautiful! That braid is amazing! 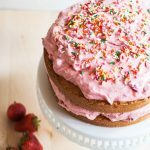 Love this recipe – thank you for sharing! 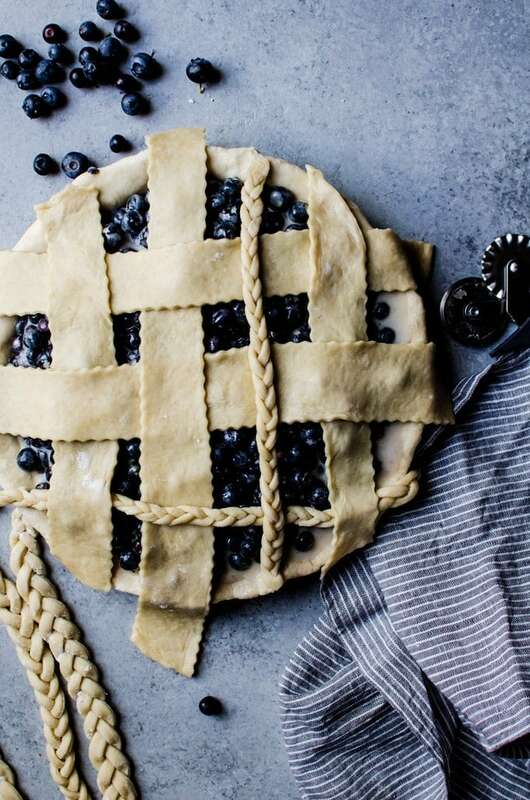 The photos for this blueberry buttermilk pie is breathtaking. My hat is off to you with that incredible braid. Sadly, I have never been able to succeed in braiding.Though after seeing this I am so encouraged to give it a try. Cheers! 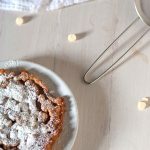 I love the idea of using ginger in the pie! 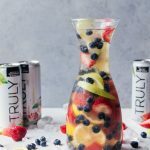 This sounds like such an amazing mix of flavors! Oh this is so gorgeous, love the braid! 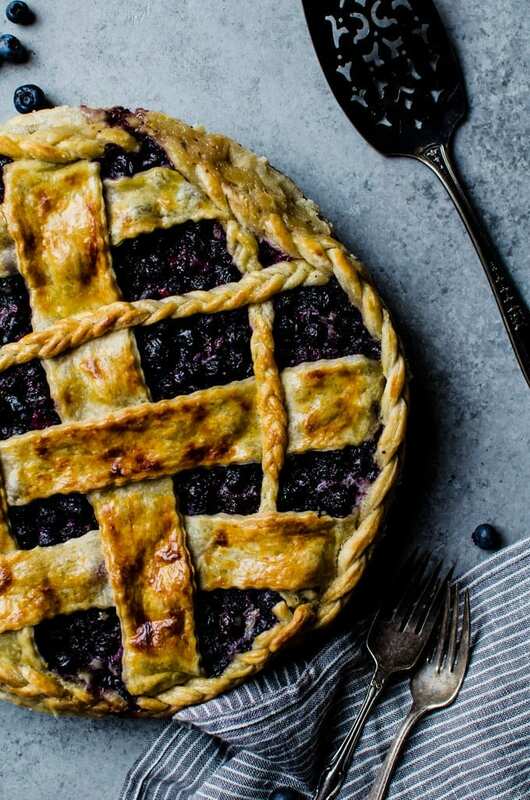 I’ve actually never made a proper pie (they are way less popular/less part of culture in NZ/Aus) but really feel I should give it a go – love the combination of ginger and blueberries too, and the addition of buttermilk is such a good idea!